Documentation of wall A as it was during shooting. All artworks selected from the permanent collection of the Museo Tamayo. Documentation of wall B as it was during shooting. All artworks selected from the permanent collection of the Museo Tamayo. 2012, Primer Acto, Museo Tamayo, Mexico City. Adad Hannah has a special relationship with theater. Not only because for fifteen years, from the age of 2 till he was 17, he was on stage as a performer, a role which later he moved to the stage of contemporary art as an artist. But because his interest in observing, or better in the term used by Jacques Lacan as "the gaze", stems from how viewers perceive what happens in reality. Hannah uses video as a medium, but his approach is much closer to the base of photography and its potential to keep things inanimate. When entering the museum, Hannah observes the behavior of the public, knowing that there is a code and rules that tell us how we acknowledge what we have in front of us. The artist is therefore interested in finding the relationship between the constructions that are generated within the institution and the power of the spectator as an historical agent. In this sense, Hannah afirms that “the theatrical” plays a role in his work, "or maybe it makes more sense to say that the relationship between the viewer and the people in the video is theatrical. Hannah states, "At its core I think my work is a performance, the performance of standing still, which is the base performance of and for photography. Then, when that performance is recorded and played back a new performance takes shape, that of the viewer in front of the work, the performance of observing. Of course these are in some way double performances as the viewer is both a viewer and a performer at the same time”. In Reflejando el Museo (Mirroring the Tamayo), a new work created for presentation in Primer Acto, the artist uses more than thirty works from the collection in a new installation similar to the “cabinets d'amateurs”. 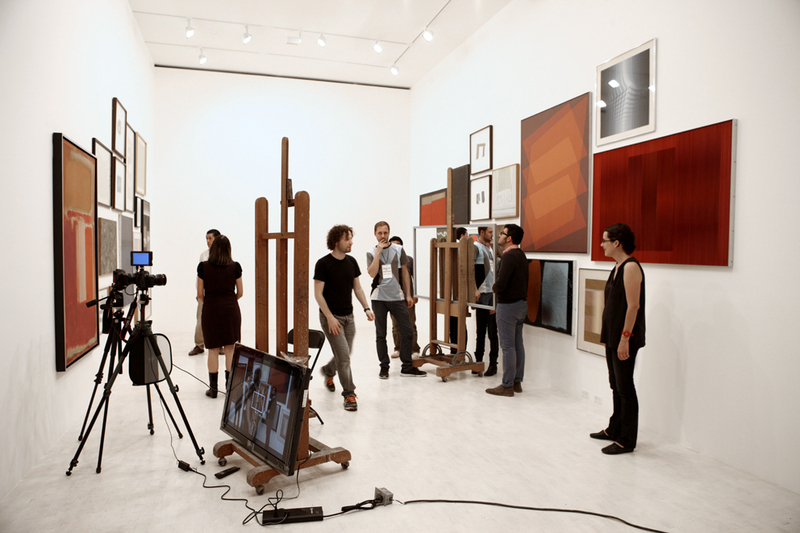 Artists such as Julio Le Parc, Mark Rothko and Carlos Cruz-Diez are arranged on the walls as a set to be videotaped by the artist. However, in this process, the museum staff, who make possible the realization of this work, go one step further and become implicated as models when a recording of the installation is made. 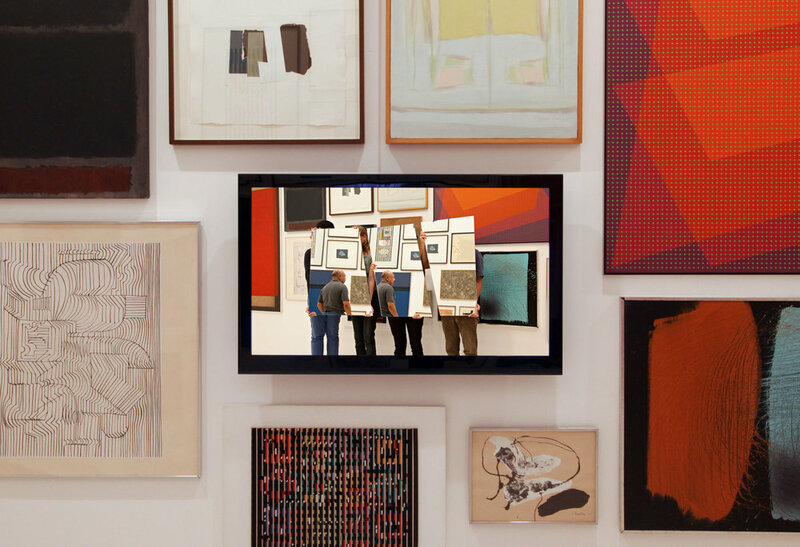 A small group of employees, specifically selected by the artist, hold pieces of mirror in front of the collection in this montage divided amongst two walls facing each other. Hannah thus not only makes evident the works, but the reflection of them is captured in a video that then is inserted between the paintings as if it were another work. This means that we see a mirror reflection of the collection suspended in time. “With Mirroring the Musée [the first work produced with opposing walls and opposing screens] I wanted to somehow reflect the museum to itself, to turn the act of viewing inside-out and further complicate the relationship between viewers and artworks. There is also the element of real-time vs the recorded image, and the way the viewer is somehow invisible within this back and forth between the two screens. The models for Reflejando el Museo (Mirroring the Tamayo) were all employees from the various branches of the museum, including curators, librarians, and administrators. Although this is not clear in the finished work it was interesting for me to produce the work this way, recasting the employees performing roles in the museum that differ from their regular day to day activities. The installation of the work, its placement on the same plane as the works of art seen in the videos is also somehow simultaneously disruptive and harmonious”. The idea of observing a moment where everything is in stillness but not necessarily lifeless, makes us perceive a reflection in which we begin to recognize certain resemblances between the viewer and the works of art. The apparent tableau vivant is thus somewhat lost amidst the representation and the real. The artist states that "there is also a performance within time, the suspension of disbelief is quickly suspended and we are left watching what is clearly a person trying to stand still - their uncontrollable breathing and persistent blinking undermines any performed role and exposes the person, the vital force of neurons and synapses pushing forward through time. There is also this sequential stillness, what Bazin refers to as mummification, where movement is reduced to a series of still images - the basis for film. I see the double representation of time occurring as the viewer flips back and forth between feeling that they are stuck in a staring contest with another person across from themselves, and the obvious realization that they are watching a recording, a record of something that happened during some previous place in time”. In this relationship between performance, the spitting image, and the double, Hannah makes a basic association between the viewer and the space of representation. Repetition becomes crucial in order to understand the reappearance of multiple times and therefore to emphasize particular moments. Perhaps it is inevitable to mention Baudrillard when he says that "images are no longer the mirror of reality, they have invested the heart of reality and transformed it into hyperreality where, from screen to screen, the only aim of the image is the image. The image can no longer imagine the real because it is the real; it can no longer transcend reality, transfigure it or dream it, since images are virtual reality. In virtual reality, it is as if things had swallowed their mirror”1. In this sense, Hannah is an artist that does not imagine the real but rather presents reflections of the real as genuine images. 1 Baudrillard, Jean. "Aesthetic Illusion and Disillusion." In The Conspiracy of Art: Manifestos, Interviews, Essays, edited by Sylvère Lotringer, translated by Ames Hodges, 120. Cambridge: Semiotext(e), 2005.